Blue Bird In this car, built in 1960, Donald Campbell set a new World Land Speed Record of 403.10mph (648.783kph) on 17th July 1964. 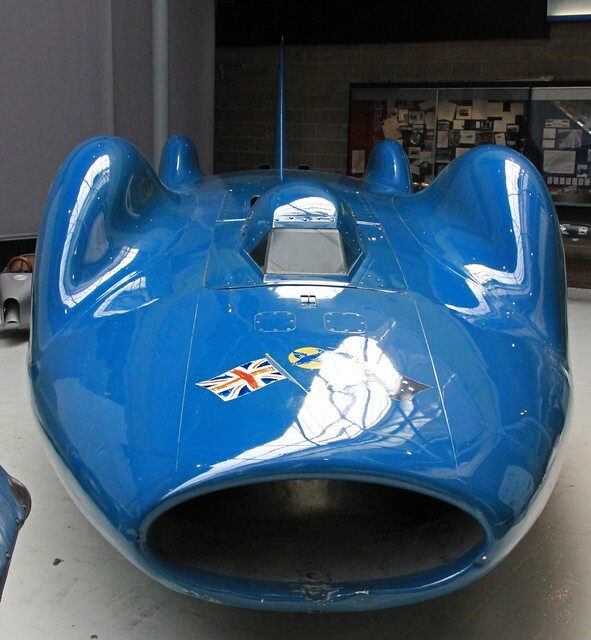 Blue Bird had cost £1million to make and was powered by a Bristol-Siddeley Proteus 4100bhp gas turbine engine. The tail fin was a late addition after a disastrous crash at Bonneville, Utah in 1960. Lake Eyre, South Australia was then chosen because it was a desolate flat salt plain. However untypical rain became one of the series of frustrating delays which dragged the record attempt on for two years. When the record was finally attained, Campbell returned to water speed record breaking. Housing a collection of over 250 automobiles and motorcycles telling the story of motoring on the roads of Britain from the dawn of motoring to the present day, the award winning (Winner - The International Historic Motoring Awards of the Year 2012) National Motor Museum appeals to all age groups. From World Land Speed Record Breakers including Campbell’s famous Bluebird to film favourites such as the magical flying car, Chitty Chitty Bang Bang and rare oddities like the giant orange on wheels. Don’t miss exciting extra features such as the Motorsport Gallery, Wheels and Jack Tucker's Garage - A permanent, multi award-winning 1930's garage has been created within the Museum, complete down to the last nut and bolt and rusty drainpipe. Whilst the building is a complete fabrication, everything in it - all the fixtures, fittings, tools and ephemera - are genuine artefacts collected over a period of 25 years.